Don't be surprised if a new Sly Cooper collection, a new Patapon and a not-so-new Twisted Metal game are announced for the PlayStation 3 in the coming weeks. A retail source points to all three titles coming soon. Now, none of that may actually come as a surprise, as it appears that Sony is counting down to something Patapon related the week of E3. Is A New Patapon One Of Sony&apos;s E3 Surprises? 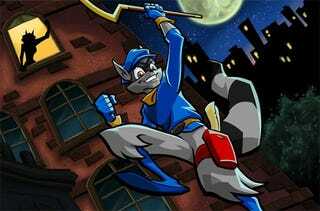 And 1UP just posted (and pulled) images from the E3 2010 showfloor that indicated a Sly Cooper collection (in 3D!!!) will be available for the PlayStation 3. That's all backed up by a retail source who tells us that The Sly Collection, Patapon 3 and Twisted Metal X will be coming to the PlayStation 3. On top of that a PSP version of PlayStation Move game EyePet is on the way, as is a PS3 version of PSP game Invizimals. Sony's E3 2010 press conference kicks off at 11:30 am, Tuesday morning. Stay tuned. Update: That new Patapon game is actually a PSP title. Twisted Metal X's final name is simply Twisted Metal and in development at Eat Sleep Play.